I will not buy this screwdriver. It is sonic. Stupid translator. They don't make TARDISES the way they used to. I still do not own Doctor Who or Monty Python. Both are the work of the BBC. Monty Python is owned by John Cleese, Eric Idle, Michael Palin, Terry Gilliam, Terry Jones and the late Graham Chapman. And now for something completely different: a man with two hearts! "Welcome to the Intergalactic Game Salon!" said the Doctor as he and Yumi stepped out of the TARDIS. "It features games from various galaxies. We're 500,000 years into your future, when the human race joins in. Not that it matters for Go, since most civilizations developed it independantly. They also have Chess and Shogi." "I've tried those," said Yumi. "Go is way more fun." "How do you always win?" asked a human player at a nearby table. "I'm the champion of Go here," said the alien who had just beaten him. "And you're just a human. Your kind may have been promoted to a third-level civilization, but you're still no match for me." "I don't care how strong you are!" intervened Yumi. "That racist remark was uncalled for." "Why don't you put your money where your mouth is?" asked the champion. "Only if we don't take the money part literally," said Yumi. "Look, if we're going to bet money on the outcome of this game, we need a 50-50 chance of winning," argued Yumi. "If you're so much stronger than humans, you've got nothing to gain by beating me." Yumi sat down across from the champion. They used a randomizer machine to determine who played what color. Yumi played white. "Good luck," replied the alien. "You'll need it." The alien played his first move on a 1-2 point. Yumi had seen human amateurs play like that, but she had never seen the Slitheen or the Doctor play like that, and she had never seen anything useful come from that move. 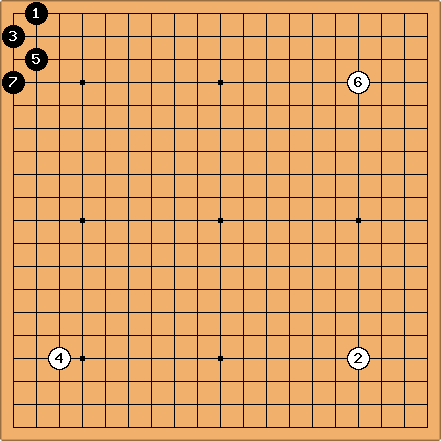 Yumi's first move was on a 4-4 point near the corner diagonally opposite the corner that the alien's black stone was near. The alien played on the 2-1 point - one point diagonally away from his first move. Now the two black stones formed an eye in the 1-1 point in the corner. Yumi was starting to get frustrated. Her opponent seemed to be diving into building territory immediately with no knowledge of framework. Yumi's suspicion proved to be correct. Throughout the game, her opponent continued to extend his territory like a worm, while Yumi angrilly solidified her territory from the framework she had built across the board. Yumi won by about 300 points. "How did you make such a comeback?" asked her opponent. One of Yumi's eyebrows twitched. "What kind of comeback did I make?" she asked, trying to control her rage. "I had a few points of territory in the beginning while you had zero," said the alien. "Only if the game were to end right then!" said Yumi, who was starting to lose control of her tone. "The game never ends at a position like that!" "Why do you sound so angry?" asked the human who had lost the previous game. "You won. You beat our champion." Yumi had tried to keep her manners under control, but she could no longer hold back her sarcasm. "WHOOPTY DOO!" she screamed. Yumi clapped her hand over her mouth, feeling guilty for her rudeness. "Um, I should probably get going," she said. She then ran toward the TARDIS. "I honestly have no idea," said the Doctor. "Last time I visited here, these people were stronger than Sip Fex Thek Sharlaveer-Bar Slitheen." "What does 'last time you visited here' mean for a time traveler?" asked Yumi. "Well, I made sure to arrive here this time shortly after my last visit relative to the causal nexus of this place." "Right," said Yumi. She had never heard the term "causal nexus" before, but she had a pretty good grasp of what the Doctor was trying to say. "You said the people here were stronger than the Slitheen," said Yumi. "Do the Raxa...um, Raxa...do the Slitheen have time traveling technology?" "No," answered the Doctor, "the Raxacoricofallapatorians do not have time travel. They have short-range teleportation technology, and their ships can travel significantly faster than light. But they aren't quite to the level of manipulating the time stream." "So Sip Fex Thek Sharlaveer-Bar Slitheen had to have been born in roughly the same time period as I was, but on another planet. So if we go back to my present time, but land on Raxacorico-whatever..."
"Sip Fex Thek is on probation," interrupted the Doctor. "And it would be too dangerous to meet him before that event in his life. It would twist the causal nexus." "But there should be other Slitheen who are just as strong, right?" said Yumi. "Yes, but every Raxacoricofallapatorian in the Slitheen family is trained from birth for crime," replied the Doctor. "It's a family tradition passed down between generations." "Okay, but what about other Raxacoricofallapatorians?" asked Yumi. "Oh my gosh, I can't believe I finally said it!" "I sure hope they have the strength," said the Doctor. "Let's go. Ikuze!" The TARDIS materialized in the local game station of Raxacoricofallapatorius. Yumi and the Doctor disembarked. "Excuse me," said Yumi to the Raxacoricofallapatorian who looked like she was in charge. "Do people play Go here?" "Go?" repeated the receptionist, looking confused. "Igo!" said Yumi. "Weiqi! Baduk!" "Igo...Weiqi...Baduk...no, none of those games ring any bells." "Doctor," whispered Yumi, "If the TARDIS translates everything I say, why is she repeating the names I said with the same pronunciation?" "Because none of those names are being translated," the Doctor whispered back. "They're all the same game," he said to the receptionist. "It has many different names throughout the universe. I believe you call it Davivenkujedekemogopy." "Sorry," said the Raxacoricofallapatorian. "I've never heard of Davivenku...what you said." A Raxacoricofallapatorian is having trouble remembering how to pronounce a long name? thought Yumi. This is going from bad to worse. "Yumi, we have a problem," said the Doctor. "Reality is being warped. Time itself is being wounded." "So Go no longer exists?" asked Yumi worriedly. "Not on Raxacoricofallapatorius," asnwered the Doctor. "As much as I love the game, I must admit that it could be worse," said Yumi. "Entire races could be disappearing." "You're right," said the Doctor. "It could be worse, and unless we do something, it will get worse. This is only the beginning." "But why is this the beginning?" asked Yumi. "Why is it starting with Go?" "A wound in time could start anywhere," answered the Doctor. "If it's untreated, it always spreads." "So what do we do?" asked Yumi. "We consult the police," said the Doctor. "Yumi, where are you going?" he asked as Yumi headed for the TARDIS. "We don't need the TARDIS. The police office is just across the road." "What, the Raxacoricofallaptorian police?" said Yumi skeptically. "I thought you said they didn't have time travel." "No, but they might have some information that I need," said the Doctor. "How may I help you?" asked the police chief. "We'd like to look up crime records for Sip Fex Thek Sharlaveer-Bar Slitheen," said the Doctor. The chief entered some keys into his computer. "Sorry, I have no records of anyone by that name." "He tried to take advantage of weak gamers on Earth," said Yumi. "Earth crimes, eh?" said the chief, typing on the computer again. "Nope. The Sharlaveer-Bar Slitheen sub-family is as notorious as any Slitheen, but they have no record of crimes against planet Earth. Nor do the Fex Thek Slitheen. Now the Fel Fotch Pasameer-Day Slitheen have attempted a particularly nasty crime against Earth." "I know them," said the Doctor. "I stopped them from blowing up the Earth with nuclear missiles. But you're saying that Sip Fex Thek Sharlaveer-Bar Slitheen doesn't exist?" "I'm afraid not," said the chief. "I think it just got worse," said the Doctor. "To the TARDIS!" "Earth," answered the Doctor. "We need to check the damage there. Ikuze!" Ikuze is the Doctor's new catch phraze. It's a childish way of saying "let's go" in Japanese. The Doctor may be 900 years old, and he is wise in many ways, but somewhat childish in others. In the official Doctor Who, the Doctor's tenth regeneration said "Allons-y" a lot, which is French for "let's go." I know nothing about formality levels in the French language, if there are any.